I really do love the FCC, especially when they reveal phones that should be secret. Today’s glimpse, the myTouch Slide (a.k.a the G1 v2). 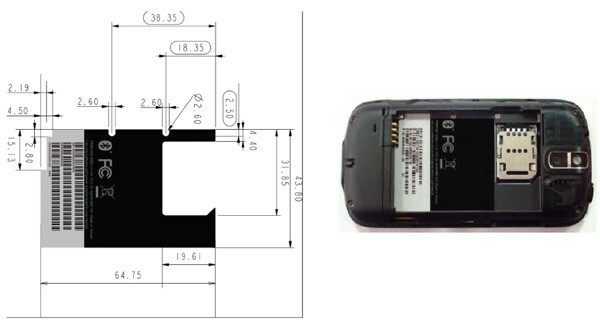 The FCC documents have cleared and with that information comes a picture of the back side of the myTouch Slide. Said device features WCDMA Band IV/AWS /T-Mobile 3G (depending on your phone band know how). We are still waiting for more information on this phone, but a spring launch (maybe May) looks possible. We will keep you updated with any new information. Now, let’s all breathe in deeply as the HTC HD2 news might start to get over shadowed (might). Leave your thoughts in the comments! ← Boo Yah! Evansville, Indiana Gets 3G! MicroSD memory cardslot is accessible without battery removal. It is a push to insert and push to remove design. Optical trackpad with an integrated push button. Is there any chance we will see Sense UI on it. ANYTHING faster than 528Mhz would be appreciated and needed at this point. Don’t like the name though… not that it matters since I got the HD2, but still would like to see more powerful Android phones on T-mobile. Not only has VZW and Sprint caught up to the Android parade, they’re passing T-mobile by. You’re wrong Fila, it’s an ARM11 processor. We just don’t know which ARM11 it is. Really hope they made the front of the phone look better. Hopefully they also added the 600mhz processor found in the Legend at the very least. The phone will look better, and yes, I would hope so too. 600 Mhz at a minimum. No, actually. We were talking about what we want and what they should put into it. We WANT 600 mhz at a MINIMUM. Oh yes… I agree, definitely WANT a 600+mhz cpu. I think that would be ok if it has a dedicated video chip. If the CPU is doing everything it seems like 1ghz will soon be par. Unfortunately, if I had to put money down, I would say that Tmo will give us 600mhz MAX. lol unfortunately sidekicks are still around. i had one years ago when the SK3 was spankin new, but lack of customization was a real turn off. i swore by that phone though cuz of the $20 unlimited features which i wish there was now for any smart phone. If you ask me, there has already been a Sidekick killer – Microsoft. After the Great Sidekick Outage in October, I’d say a good 75% of its users fled to different devices. I was one of them – switched to a BlackBerry 9700 & I wish I had switched sooner! I’m not 100% happy w/ the BlackBerry, but it’s a great phone to have while I wait til the perfect Android device releases on T-Mobile. We’ll see if the MyTouch Slide is the one…but I’m not counting on it thus far. IM SOOOO READY FOR THIS! I had the cliq for 6 hours before I took it back. Ugh, I hated it. And how EXACTLY do you know this? Im just curious. I just know, in a couple of weeks you guys will find out if a “ninja” doesnt send tmonews the proof before then. Release date the 5th of May I believe. His proof = “i just know”. Since when does that count as proof? If this thing is called the myTouch espresso, then i will give away my nexus for free. Its gonna be the myTouch Slide if anything. Besides, its not official until actual release day. Okay I will send you my address come May. Yes espresso is just a codename. Too bad “myTouch” wasn’t the codename. Too bad someone even thought of the words “myTouch”. Too bad T-mobile thought it was good. Anon, Why would they call it the myTouch espresso? in your mind do you think thats good marketing? Despite all the rumors im putting my money on it being called myTouch Slide instead of Mytouch espresso. Could it have sense ui? maybe, but i doubt it. snapdragon? Maybe but again i doubt it. I do expect it to have at least 2.0.
myTouch espresso…HA! I like your confidence kid…i do. Android 2.0 ? Hum, interesting !?! Can’t wait to see some leaked photos of this device. From what I hear it will be thinner than the G1. I like a physical keyboard but could get used to an onscreen keyboard I guess. This device will be a good option for those who want a slide out physical keyboard. I am also glad to hear it will have Android 2.0 and a faster processor and larger battery capacity! Hopefully it will have more internal memory as well. Not sure but it sounds like the GSM version of the Droid. Of course HTC is making the phone. Based on T-Mobile’s past history with Android devices–excluding the Nexus One– it’ll probably be an underpowered version of the Droid. Hope you’re right about the names. Yes, please don’t get an HD2 if you don’t want one because I’ll Hulk out and destroy the entire internet if I hear another Apple or Android fanboy bash it when its actually a terrific and nearly-flaw-free phone (something I could never say about my dismal G1). wait i have a cliq its like about 2 weeks old maybe 3, can I return it/trade it for a different phone. I didnt read all of the posts, so someone else might have posted this. The phone is an HTC Espresso but Tmo will sell it as the my touch slide. OMG it isn’t a dragon slayer? Why bother? Because other folks need an updated G1 and this looks like a contender. I’m not dropping my N1 for it, but the wife’s G1 is getting long in the tooth, and a weeklong foray with the HD2 convinced her to stick with the G1 til an android device with a keyboard and little more horsepower was released by TMO. Lets hope we don’t have to wait til summer. Also, if its not going to be the My Touch Slide, then why is radio shake already listing it on thier direct2u site as such? Tell that to that Anon guy up there. Have you all seen the leaked pic of the phone? I have, and it looks to me like a myTouch (with a QWERTY keyboard that I don’t like, the keys in a slanted, forward motion look to them). Anyway, T-Mobile has put a lot of money, time and promotion into the myTouch brand so I say no way that they would abandon that marquis. Besides, a slider keyboard myTouch is a natural evolution for the brand, a touch screen only for those who want that, and a physical keyboard for those looking to replace their aging G1 handsets. Sidenote: I will be getting this phone for my girlfriend who is using my aging G1. I asked her today how she feels about her G1 and she said loves the phone, but she does not know what she is talking about. It’s time to replace the old bag (the G1, not her). The great thing is rooted, used G1s are selling for $70 – $100 on eBay still. I was gonna keep mine as sort of a backup communicator for wi-fi spots… but eff that ess, I’m selling this thing while I can still get some clams for it. Given some of the moves lately, what it be to far out there to think this is not a windows phone. If it was I might just have to walk into the shack and puke on one. You caught me. My patience with photo editing only goes so far. Plus I like spreading the gossip and rumor that the myTouch Slide will come with WinMo and a desktop version of IE. According to the rep at the Tmo store in Manhattan. You can find it at 36th and 8th ave. The kid told me that a Tmobile exec. brought one in early February and 2 things he said stood it-the screen was much bigger and the OS was much faster. He mentioned the look seen in the leaked photos. Track pad, with touch sensitive buttons. One other thing, the exec did not let any of the reps handle it so, either a great lie, or sounds like I will renew my contract if thing phone has a 3.7 or higher super amoled screen, 1ghz processor, htc sense 2.1 and atleast 4gig internal memory. One can dream….Anyone in NYC, can head up to store ans speak to him. He a spanish kid, cool dude…. Hope this unit isnt as ugly as the test mules ones that surfaced two weeks ago. The one that looked like the phone was designed in 1999 for a 2000 release. Well the leaked pic that has been around for a time looks lackluster. People should look at the related post in here to see for themselves. I tried to improve the look by editing in more saturation, but hardware wise I don’t like the look all that much, as said above, what I call the “forward motion” looking keypad and the chrome wing look trim over the ear piece. I too hope that it looks better than what we have seen so far. I suspect it will. Oh, and I would not mind at all if the screen titled like the Touch Pro2 does. If the screen is 3.7″ that will be bigger than the Touch Pro2 I had. An Android device to replace the G1, with 3.7″ and tilt, man I am actually looking forward to it. And I have had my Hd2 only two weeks. But this would join the family, not replace the HD2. Bonus sidenote: To me this would be a great response to Sprint’s Android-powered EVO. Did you just compare the MyTouch slider to the Sprint EVO? An htc rep came into my store and told us that the mytouch slide will have android 2.1 on it. He also said the hd2 is getting a sense ui software update soon. This is kinda getting old and I honestly think (Hope) Tmobile bump up the specs like they did with the HD2 and while I don’t feel like they will make it the next Nexus One, Droid, Samsung Moment or anything high end it should at least come with improved specs not a repackaged mytouch with keyboard and another UI. I love tmobile bundled with Android but magenta is dropping the ball. I hope they say these phone needs to look better and give it a better processor and more memory with a higher screen res. I don’t think we will get a high end android phone just yet because of HSPA+ and the release of the HD2 since its the new star and tmobile won’t have more than one. At a meeting a month back in San Francisco, an exec came in mentioning two new devices coming. When I first saw the leaked pics of the Mytouch slide, the first question I asked him was, Is a Mytouch with a keyboard one of them? Of course he looked surprised and said yes. The other phone coming in fall he said was a Nexus “Like” device which makes me believe the Mytouch will not be a highly speced phone. I thought maybe we would get the HTC Desire hence the Nexus Like but who knows. If i had to bet, this device will launch sometime in May. Reps are being asked to become device Champions for this device and the dead line is the 14th of April. Once those go through, look for this device in reps hands in a month or less. Oh and he did mention one will be running Sense UI, he just wouldn’t say which one. I’m guessing the Mytouch will be just googles os to keep it a 100% You, lol. Oh wise Magenta, why do you torment us? Here is the great savior of cellphones…the HTC HD2, but its using a soon to be outdate OS. Here is the MyTouch installment…the MyTouch Slide, really great idea but probably MyTouch with a keyboard. No improvement on processor, res, or camera. Why not find a way to bring in the masses? GSM Droid or Droid 2? Blackberry Striker aka Pearl 9100? These are phones Mighty Magenta should be pushing out, not second tier wanna-bes. Until our beloved carrier steps forward in this area will be a second tier carrier.